Tuesday Tasting is a regular feature of Lyke2Drink that explores some of the best beers, wines and spirits on the market. This week we head to the islands for some special rum. One of the best trips my wife and I have ever enjoyed was to Jamaica to visit an all inclusive resort called Ciboney in Ocho Rios. I was writing regularly for a hotel trade magazine at the time and used to get tons of great invitations to places that we would never be able to afford back then. My regular job kept me too busy to take most of the offers, but we were smart enough to say yes to the public relations people who contacted us with the invite to Jamaica. On top of having a great time, I did get a couple of articles out of the trip. We loved our time on the island and the hotel did a great job hosting us. One of the lasting benefits of the trip was a new found affinity for rum, particularly the Appleton brand. Appleton is a Jamaican classic. Part of J. Wray & Nephew, which has been making rum since 1749, Appleton takes its name from the island's largest sugar cane plantation. I had a bottle of Appleton 12-year-old in my bar and recently received a bottle of Appleton Reserve, a rum released in the U.S. this Spring. Appleton 12-Year-Old: Nice amber color and sweet nose. The rum is both mellow and has a slight edge that is actually inviting. Tons of flavors, including vanilla, toffee and a hint of oak. A great sipping rum. Appleton Reserve: This amber spirit is a blend of 20 different rums from the Appleton rackhouse. There is more spice and oak to this rum and it lingers a bit longer on the center of your tongue. There is only a faint hint of sweetness to the nose and some hazelnut hues in the finish. One of the most famous names in California wine has been sold. Stag's Leap Wine Cellars, a Napa Valley winery recognized as a consistent producer of great wines, is being sold to a partnership of Italian winemaker Marchese Piero Antinori and Ste Michelle Wine Estates, the giant Washington state wine company. Warren Winiarski, 79, his wife, Barbara, founded Stag's Leap in 1972. The winery's first vintage, a 1973 Cabernet Sauvignon, played a key part in the famous Judgment of Paris tasting in 1976 that put California wines on the map in a head to head tasting with wines from Bordeaux. The sale includes the Stag's Leap brand, the SLV and Fay estate vineyards and the winery. Winiarski retains the Arcadia Vineyard and will provide grapes to the Antinori and Ste Michelle. Antinori and Ste Michelle have another joint venture, Col Solare, a wine produced in Washington. Ste Michelle's brands include Chateau Ste Michelle, Columbia Crest, Erath Vineyards and Conn Creek. The Information Center for Human Rights and Democracy (ICHRD), a Hong Kong-based group that is one of the most reliable sources regarding human rights inside communist China, says Chinese police and environmental protesters clashed at a brewery in Yuanshi over the weekend. The protesters claim the brewery, in Sichuan province, is contaminating drinking water and water used for farm irrigation. According to the ICHRD, seven protesters were taken into custody by the People’s Armed Police and 20 others were injured. The brewery is run by China Resources Breweries Co., a state-run company that has links to SABMiller. Local citizens claim the brewery dumped untreated waste water into a river. While China is going through rapid industrialization, there have been a number of recent protests by people concerned about the environmental impact of factories and chemical plants. Environmental laws in China are decades behind western regulations when it comes to things like waste water treatment and air emissions. The St. Lawrence River as it runs through the Thousand Islands is a special place for me. The spot along the New York and Ontario border was where I'd go for a week or two each summer to fish with my Dad. It's also the spot where I met my wife, Sandy. It is one of the most beautiful places on Earth, as inviting in the summer as it is formidable during the winter. I once woke up on a winter's morning in Alexandria Bay to discover it was 42 degrees below zero -- before they applied the wind chill factor! Last week Sandy and I were lucky enough to visit family on Wellesley Island along the St. Lawrence. We were the guests of Barron and Bette Boyd and got a chance to catch up with several members of the Salvagno clan. I brought some beer from the southeast and some whiskey samples obtained during recent magazine article and blog entry tastings for all to enjoy. We even made a side trip one day to Kingston to buy some Canadian beer -- Molson Stock Ale, Waterloo Dark Beer and St. Ambroise McAuslan Oatmeal Stout were imported safely into the U.S. -- and to stop at Kingston Brewing Co. The highlight of the visit was the chance to catch up with everyone and do nothing more than watch the river traffic pass by with a beer close at hand. That's the way all summer days should be spent. Disney is a merchandising machine. The company also does not shy away from alcohol -- just visit Epcot Center and you will find you can drink your way from Germany to Canada and never get on board a jet. However, Walt Disney Co. has decided not to mix the two when it somes to a popular kids film. Disney opted to back away from a promotion involving Costco just as the warehouse chain was set to sell Ratatouille Chardonnay, a white wine from Burgundy. Ratatouille is the main character of the Disney-Pixar movie of the same name. The plot line involves a rat in Paris that loves fine cuisine. The promotion was drawing criticism from people who feared it would encourage underage drinking and some California winemakers. Most of us could never afford to buy a bottle of Petrus 1996 for $1,925, but we might be willing to fork over $65 for a sip to be able to say we have tried the wine. That was the idea behind a program at a number of retail shops in the United Kingdom that allowed consumers the chance to try some of the world's great vintages a 25 milliliter sip at a time. That at least was the case before Trading Standards Officers from the Westminster City Council stepped in. Selfridges and The Sampler had been running the program. The bureaucrats, however, declared that the stores were "selling wine in illegal amounts" and ordered the retailers to halt the programs. "Illegal amounts" sounds like they were selling huge quantities at low prices to underage drinkers, not offering consumers a chance to sample upscale wines. Trading standards officers point to a law that says licensed premises must sell wine in either 125 milliliter or 175 milliliter glasses. Obvious, this law was created to help protect consumers from short pours at restaurants. Instead, it is being used to keep wine lovers of average means from sampling great vintages. Score one for big government. 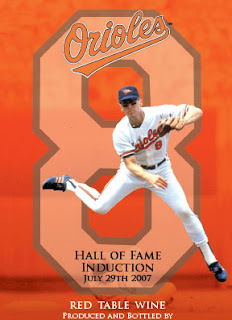 Cal Ripken Jr. played for the Baltimore Orioles from 1981 to 2001 and along the way set the Major League Baseball record for consecutive games played at 2,632. During his 21 years in Baltimore he became known as one of the best infielders in baseball, while hitting .276 for his career and amassing 431 home runs. On Sunday, he will be inducted into the Baseball Hall of Fame in Cooperstown. To celebrate the Orioles are throwing a party and handing out special bottles of Cal Ripken Jr. Wine. Georgia Angelos, wife of Orioles owner Peter Angelos, has had a special blend of red wine from Charlotte’s Vineyard in Middlefield, N.Y., bottled with an image of Ripken and his number 8. Just 700 bottles of the wine were made and will be given to guests attending a party Angelos is hosting in honor of Ripken. Ripken, with 98.5 percent of the votes cast, and San Diego Padres Tony Gwynn, with 97.6 percent of the votes cast, both made it into the Hall of Fame on the first ballot. London is one of the world's most expensive cities and Crystal is one of the most expensive nightclubs in London. A businessman said to be from Dubai can attest to this after running up a $216,632.43 bar bill at the club this past Saturday. Crystal, which is famous for celebrity and royal sightings, has seen its share of big bar tabs. Nothing comes close to the giant cost of the party the Middle Eastern businessman and 15 of his friends rolled up. Tuesday Tasting is a regular feature of Lyke2Drink that explores some of the best beers, wines and spirits on the market. This week we spend a couple of days wandering around Chicago tasting Midwestern suds. One thing was clear during my recent visit to Chicago: People in the Windy City like to gather in taverns and hoist a few. Great neighborhoods across the city are centered around restaurant and entertainment districts. We were focused on trying fresh Midwestern beer and found our way to some of the best beer bars in the country. Places like Sheffield's, Hopleaf, Clark Street Ale House and the Map Room. We even had time for a stop at Goose Island's Wrigleyville brewpub and two Ram Restaurant and Brewery locations, one in Schaumburg and the other in Rosemont not far from O'Hare Airport. Founders Centennial IPA: A clean and crisp IPA with good floral notes and a nice hop bitterness. Goose Island Maltilda: This Belgian-style ale is 7.0 percent alcohol by volume. It has an inviting flavor profile that combines a malty sweetness, hints of fresh fruit and some spice. Goose Island Pere Jacques: Named for a Trappist monk that brewmaster Greg Hall encountered during a visit to Belgium, this 9.0 percent alcohol by volume brew is a rich mahogany color that is a complex malty and fruity ale. Great Lakes Edmund Fitzgerald Porter: One of the best porters in America. Nice roasted nose and a beautiful coffee flavor base. Good tight head and dark color adds to the enjoyment. New Holland Mad Hatter IPA: Full rich hop nose and flavor in a golden amber package. The rich head stands firm throughout, lacing the glass. Ram Total Disorder Porter: A nice slightly malty flavor with a touch of smoke in a very drinkable dark beer. Two Brothers Cane & Ebel: A wonderful 6.8 percent alcohol by volume brew using rye malt and Thai palm sugar. The beer is a mahogany color and malty, with a touch of nut flavor. Two Brothers Hop Juice: Pulled from the cask using a beer engine, this is a classic bitter ale. Slightly cloudy appearance, with a clear hop flavor. Three Floyds Dreadnaught: This high gravity brew is a hop explosion in a glass. Nice dark color, aromatic nose and good fresh hop bite. Ever wonder what it is like to live like a high roller in Las Vegas for a weekend? HPNOTIQ Liqueur is sponsoring a“Vegas VIP Sweepstakes” to give a lucky winner the chance to find out. The grand prize winner a trip to the Mirage Las Vegas for a three day, two night stay with VIP treatment at the Mirage Nightclub JET with $3,000 in VIP cash, plus first class airline tickets. Five second place prize winners will be receive limo service in their hometowns for a night out with friends. One hundred third place prize winners will receive $50 HPNOTIQ VIP Cards for use in the HPNOTIQ store at http://www.hpnotiq.com/catalog. You can enter now through Sept. 30, 2007, at http://www.hpnotiq.com/sweepstakes. HPNOTIQ is a blend of vodka, natural tropical fruit juices and a touch of Cognac from Heaven Hill Distilleries. During World War I Gradesnica, Macedonia, was part of the front lines with Germans facing French troops. More than 90 years later, villagers have uncovered vintage Cognac and wine that historians believe was buried by French troops who were either killed or forgot to dig up the alcohol rations. The first Cognac was uncovered in the old trenches about 15 years ago. Since then people exploring the old trenches and farmers plowing fields have discovered additional bottles often two cases at a time. Gradesnica is located close to the border with Greece. French and other foreign fighters had joined with the Serbs to try to stop advancing German and Bulgarian troops. Bottles found in the trenches could be quite valuable, but locals say they have consumed everything they have found. Weekend Watering Hole: Hopleaf Bar, Chicago, Ill.
As a regular weekend feature, Lyke2Drink will visit some of the world's great watering holes. This week we find ourselves in the Windy City at a place that brings a bit of Brussels to the Midwest. Clark Street in Chicago has more drinking options than most cities have in their entire metropolitan area. There are bars and restaurants of just about every imaginable style. A few even qualify as word class places to enjoy a brew. The Hopleaf Bar is one of them. The Hopleaf is in the Andersonville neighborhood and has an unassuming front bar room that has a combination of stools along the bar, small wooden tables and booths where patrons can sip from a very nice draught selection and a solid list of bottled brews. The Hopleaf's approach to beer is part Midwest micro beer, part national and international craft beer and an impressive collection of Belgian brews of various styles. The draught list includes Goose Island, Three Floyds, Two Brothers, St Bernardus, DeProef, Kwak and Tripel Karmeliet, among others. While the front room is a nice way to spend an evening, it is the back room at the Hopleaf that sets it apart. A two tiered dining room that comes equipped with a wood burning stove for those cold Chicago winters houses the Hopleaf's restaurant area. Brick walls and beer memorabilia set the mood and the menu delivers a Belgian theme. During our visit we enjoyed a pot of the mussels for two ($20) that included mussels steamed in Wittekerke Whie Ale, with shallots, celery, thyme and bay leaf and a healthy supply of frites with a garlic aioli. Several hunks of bread were perfect for soaking up the wonderful broth at the bottom of the pot. The staff knows its way around the beer selection and offered some good recommendations. The beers were all fresh, served in the proper glassware and at the right temperature. That's something we should expect as beer drinkers, but often do not get. We found our visit to the Hopleaf to be enjoyable and reasonably priced. It's worth venturing to the Northside of Chicago. How Green is Your Vodka? Do you think about the environment when you drink? McCormick Distilling and Premier Beverage hope you do. What's being called the world’s first eco-friendly vodka, 360 Vodka will help raise funds for the Coastal Conservation Association (CCA) Florida, a statewide, nonprofit marine conservation organization working to protect the state's marine resources. 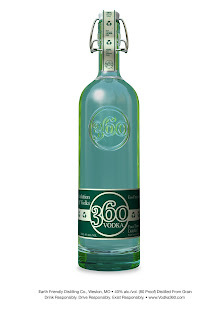 The companies will donate $20 from the sale of each case of 360 Vodka in Florida to the conservation group. The drinks firms made an advance donation of $30,000 to the CCA. McCormick says 360 Vodka is distilled in an energy efficient plant that cuts fossil fuel energy usage by 21 percent, and the packaging uses an industry-leading 85 percent recycled content glass container and 100 percent recycled cardboard for the shipping boxes. During the last five months more than 450 people in Nova Scotia have contracted mumps in an epidemic that has health officials in the Canadian province concerned about the vaccination rates, especially among young adults. Dr. Noni MacDonald, an infectious disease specialist and former dean of medicine at Dalhousie University in Halifax, has proposed a novel solution: offer vaccinations to young people at bars. The "shot" and a beer approach would be one way to reach a group in the population that is likely to be susceptible to spreading mumps and other deceases and also may not have up to date vaccinations. Dr. MacDonald has gone as far to suggest special happy hours with reduced drink prices for people who have their measles, mumps, rubella immunizations updated. Her comments were carried in the Canadian Medical Association Journal and in Canadian Broadcasting Corp. reports. Nova Scotia health officials have agreed that new approaches are necessary to reach young people. It is not clear if they plan to set up immunization clinics in bars any time soon. With the only store in the Yates County town of Potter about to be forced to surrender its license to sell beer, New York Gov. Eliot Spitzer has stepped in to grant a temporary pardon. Gov. Spitzer signed a measure to allow the Federal Hollow Staples store to continue to sell beer until another vote is taken in November to determine if the town of Potter should be dry. The town voted against alcohol sales in a recent ballot, but voters complained that the language on the ballot was confusing and that many people who thought they were voting in favor of alcohol sales actually ended up voting for Prohibition in the community. Under the measure signed by Gov. Spitzer the store can keep its license to sell beer until the outcome of a new ballot in November is determined. Tuesday Tasting is a regular feature of Lyke2Drink that explores some of the best beers, wines and spirits on the market. This week we head to France for a taste of Cognac. Cognac is a French brandy. Brandy takes its name from the Dutch word “bradewijn,” which means “burnt wine.” The French must have felt it easier to market Cognac than burnt wine. Many things can be used as a distillate to make brandy. Made in a pot still from colombard, ugni blanc and folle blanche grapes, Cognac can only come from the Cognac region along the Atlantic coast of France. It takes 10 gallons of wine to make a single gallon of brandy. Kobrand was nice enough to recently send me a range of five Cognacs from a single Grande Champagne producer, Delamain. Delamain Grande Champagne XO Cognac: Golden blond Cognac with nice fresh oak and vanilla notes. Slightly sweet and flowery. Delamain Vesper: Copper colored Cognac with a slight caramel nose that wraps earthy, oak and crème brulee flavors in a tight package. Delamain Grande Champagne Extra: Golden colored Cognac that has a subtle vanilla aroma and notes of smoke, orange peel and almonds in a slightly bitter flavor profile. Delamain Tres Venerable: Tarnished brass color and a mellow oak aroma. Wonderfully full flavor with alternating sweet and spicy notes. This is a blend of older Cognacs. The finish is long and invites another taste. Delamain Reserve de la Famille: This single barrel Cognac has a nice copper color and subtle floral nose. The flavor profile is a gentle combination of oak and vanilla. This past weekend my Brother in Law Darrin Pikarsky and I loaded up my Jeep and headed to Chicago to deliver furniture, supplies and clothing to my daughter, Brhea, who is entering her junior year at Loyola University of Chicago. One of the perks of the trip was a visit to Wrigley Field on Friday to see the Chicago Cubs play the Houston Astros. What does this have to do with drinking? If you have ever been to the corner of Addison and Clark, you would already know the answer to that question. One of the first things you see arriving at the ballpark is a statue of the late Harry Caray, the legendary broadcaster famous for his announcing style, leading the fans in singing Take Me Out to the Ballgame during the seventh inning stretch and his love of the occasional Budweiser. My wife and I had the chance to have a meal with Caray, some Budweiser executives and staff of the now defunct Top Shelf magazine a few years back at Harry Caray's Steakhouse in Chicago. Seeing the statue brought back a great memory. Once inside Wrigley you are surrounded with the ghosts of baseball's past and plenty of reminders of the link between enjoying a baseball game and enjoying a brew. Just past the right field stands is a roof top that has been converted into a giant Budweiser advertisement. In right field a billboard for Miller Lite screamed out "Houston, We Have a Better Beer." You can find beers ranging from those brands to St. Pauli Girl and Special Export around the stands. The fans, the ushers and the vendors were a pretty friendly lot -- especially since the Cubs won the game 6-0 -- and we even got to hear actor Jim Belushi lead the fans in Take Me Out to the Ballgame. We enjoyed a couple of Old Styles during the game. It felt like the Chicago thing to do. Afterwards, we spent parts of the next two days hitting some of Chicago's best bars and drinking Midwestern beers. There will be more on those experiences in upcoming Tuesday Tasting and Weekend Watering Hole segments. In further proof that world demand have whiskey is forecast to continue to grow, Diageo has announced plans to build what is being called the first major new distillery in Scotland in more than 30 years. The new $81.3 million plant would be in Roseisle, where Diageo operates a major maltings facility. The plan is to make whiskey at the plant for use in Diageo's blended brands. The company hopes to keep up with the demand for whiskey from emerging markets such as Brazil, Russia, India, China and Mexico. Construction should be completed by 2009. Marston’s PLC in the United Kingdom has purchased Ringwood Brewery for $39 million. 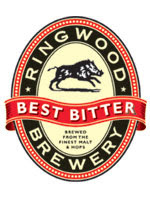 Ringwood, established in 1978, brews Ringwood Best Bitter, Old Thumper and Fortyniner. Those brands will join Marston's Pedigree and Empire IPA, among others. The acquisition strengthens Marston's position in the south of England. Marston’s recently purchased Eldridge Pope as part of its plan to have a portfolio of regional premium brands to market along side its core national products. Like the Patriots who dumped tea in the Boston Harbor in 1773, a group of Wisconsin brewers dumped beer in the Milwaukee River on Tuesday in protest of a proposed state law that they say is unfair to breweries. The brewers are upset by a proposed Wisconsin Senate bill they claim would make things more difficult for start up breweries. The state lawmakers are attempting to update some post-Prohibition era laws. The proposed law would divide small brewers into two classes: brewpubs serving food and those who want to bottle and distribute their product. The brewers say forcing a craft brewer to decide the ultimate direction of their brewery before the first pint is brewed is not fair and could destroy a business before it gets off the ground. The brewers protest was over the loss of freedom to make a business decision six months or six years into the life of a craft brewery to change directions and follow the market trends. The revisions to the current law started because it only allows brewpub owners to have two locations that sell their own beer. When the Great Dane Pub opened a third Madison location it had to sell beer from other breweries. State Sen. Fred Risser of Madison, who sponsored the bill that the Wisconsin brewers were protesting, is said to be authoring some amendments to the proposal. However, the brewers said they feared the bill, first introduced on July 3rd and headed to a committee vote today, is being expedited through the Senate without a chance for public comment. Tuesday Tasting is a regular feature of Lyke2Drink that explores some of the best beers, wines and spirits on the market. This week we head to where the Reinheitsgebot is still enforced. Plenty has changed since the Reinheitsgebot -- known by many as the German Beer Purity Law -- was first adopted in the Duchy of Bavaria in 1516. However, you can still count on German brewers to turn out some of the best made beers in the world. Much of what Americans know about German beer is shaped by straight forward lagers like Becks and St. Pauli Girl. While German brewers stick to a relatively narrow band of styles when compared say to their neighbors in Belgium or American craft brewers, there are some interesting German brews available that do get creative. I spent most of my beer drinking time this past week sampling German beers. A couple were draught beers at the Flying Saucer in Charlotte. The bottled beers were enjoyed during the monthly beer and wine group in our neighborhood -- the Society of Overlook Beverage Sippers (S.O.B.S.) -- where the theme was Oregon wines and German beers. Aecht Schlenkerla Rauchbier: If you have never had a smoked beer before, this classic from Bamberg is a great place to start. Germans call smoked beer "Rauchbier" and it is a traditional style of Bamberg. Schlenkerla brewery originates in the middle of Bamberg's old town, directly underneath the Bamberg Cathedral. The beer is indeed a heavenly treat. The smoke flavor has characteristics similar to a well made Scotch. The flavor is distinct, yet not over powering. This beer would work well with a gourmet meat and cheese platter or with some chopped pork barbecue. Erdinger Hefe-Weizen: The Erdinger website says this beer comes 'with fine yeast' that results in a traditional bottle-fermented brew that takes about a month to mature. The bottle we enjoyed tasted crisp, had some slight citrus notes and a firm head. Kulbacher Monchshof Shwarz: This is a traditional dark lager. Very nice malt flavors with a hint of roasted grain. A lively dark brew from the moment it hits the glass, it is refreshing and satisfying. Maisel’s Weisse: Made in Bayreuth, a city in Bavaria, this brew is slightly cloudy and an off gold color. There were nice fruit in the nose, with bananas and a tart flavor profile. Very refreshing for a hot North Carolina evening. Paulaner Hefe-Weizen: (Draught) Unfiltered and a golden cloudy color. There are good hits of traditional banana and clove flavor notes. Very refreshing. Perfect for a 90 degree day. Reissdorf Kolsch: This is a golden, effervescent brew from Cologne, the home of Kolsch. Very little malt signs, but some pleasant hops. Soft and smooth. Spaten Franziskaner Dunkel Hefe Weisse: This is a dark, unfiltered wheat beer from Munich. A fairly light bodied dark beer with some good flavor notes. A bit more malty than other wheat brews enjoyed during this tasting. Spaten Franziskaner Hefe Weisse: (Draught) The brew was an inviting cloudy, golden color. Fairly dry for a German beer with nice citrus notes. Refreshing. Scientists at the University of Sidney in Australia believe they may have found the reason consuming moderate amounts of alcohol helps to reduce the incidence of type 2 diabetes and cut the risk of heart disease. The study found moderate drinking helps release glucose from muscles and the liver. The study said "alcoholic beverage consumption lowers postprandial glycemia by 16–37 percent, which represents an unrecognized mechanism by which alcohol may reduce the risk of chronic disease." Other researchers have previously found that alcohol raises HDL good cholesterol levels and helps the body more efficiently use insulin to control blood-glucose levels. The new study, published in the June issue of the American Journal of Clinical Nutrition, said one to two drinks a day resulted in the health benefits in test subjects. The first real job I ever had growing up in Upstate New York was at Peter's Polar Parlor, an ice cream stand in Fairmount, just west of Syracuse. I can state for a fact that no one ever got drunk from anything we served out the window. I'm sure the same is true for Thortons in the United Kingdom, but that does not matter. They have banned the sale of rum raisin ice cream to anyone under 18 years old. I know what you are thinking: (a) Wow they must have some really juiced up rum raisin concoction; and (b) I wonder if I have enough frequent flyer miles to escape the heat wave cutting across the U.S. and visit a Thortons. Hold on a second. The alcohol content of Thortons rum raisin is just 0.7 per cent, or 0.2 per cent above the level to be classed as 'non-alcoholic' under England's Licensing Act 2003. According to media reports on the ban it would take 28 scoops of Thortons rum raisin ice cream to equal the alcohol content of a pint of beer. It sounds like any 16 year old looking to catch a buzz would encounter brain freeze long before intoxication. For its part, Thortons says it is looking to reformulate the flavor to reduce the alcohol content below 0.5 percent. Allegheny County officials have received help from state Senators who slipped language into a proposed Pennsylvania transportation funding bill that would allow the county to slap a 10 percent tax on all alcoholic drinks sold in the county. Restaurant and bar owners are up in arms over the measure. In 2003, they successfully fought a similar bill proposed in the city of Pittsburgh. State legislators say that all they are doing is considering a bill that would enable Allegheny officials to impose the tax. Media reports indicate that county officials already have a use for the money the tax would generate: bailing out the Allegheny Port Authority. Officials have calculated that a 10 percent drink tax and a $2 per day rental car tax would generate about $38 million annually. Last year, the residents of Rock Hill, S.C., voted to allow Sunday alcohol sales in their city. Now businesses in the rest of York County want to see a similar measure on the ballot. Restaurant owners and business leaders believe York County residents would vote to lift the ban on Sunday sales. A group is circulating a petition to get the required 7,500 signatures in order for the proposal to be on the ballot. 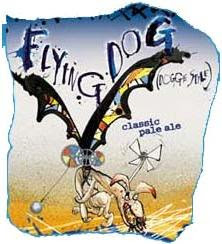 Flying Dog Brewery is offering to fulfill the dream of beer lovers everywhere by offering a trip for two to the 2007 Great American Beer Festival in Denver as a sweepstakes prize. Flying Dog’s “Great American Beer Festival Sweepstakes” runs now through the end of August. The grand prize is airfare to Denver and hotel accommodations for two, two three-day passes to the GABF, and invitations to Flying Dog activities during the weekend. A total of 500 prizes in all will be awarded, including sets of Flying Dog Ales pint glasses, Flying Dog T-shirts and key chains. 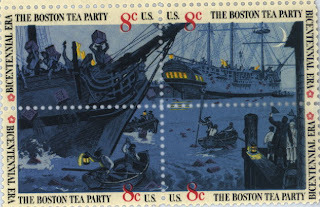 All feature the graphics of Ralph Steadman. The great thing about Flying Dog's GABF Sweepstakes is that it is amazingly easy to enter. Entries can be found at Flying Dog Beer displays at liquor and grocery stores or you can just fill one out at www.flyingdogales.com. The Great American Beer Festival is being held Oct. 11-13. With beer from more than 400 breweries it is recognized as the largest gathering of American beer. Al and Ron over at Hop Talk are hosting this month's edition of The Session and have picked an interesting topic for the fifth installment: Atmosphere. "Beer is about more than flavor, IBUs, and the debate over what is a craft beer and what isn't. It's about Life. It's the proverbial icing on the cake. Because while life isn't all about beer, beer is all about life." It's a bit off the normal beer/style review nature of The Session, but it should cause us all to pause and think about where we drink, the people we drink with and why we enjoy beer. For me having a beer is about pausing to taste life and reflect on the day. My favorite bars are not over crowded, but they are not empty. They have friendly and knowledgeable staff. They are inviting the very first time you walk through the door. After all, a tavern should be an accommodating, welcoming place for everyone. It is a hospitality business. Good food can really add to the atmosphere. The menu can be simple, like the roast beef sandwiches at Clark's Ale House in Syracuse, N.Y., or intricate, like the beer cuisine of Tim Schafer's at Lake Norman in Sherrills Ford, N.C.
A bar with a history or legend is a big plus. Places like U Flecku in Prague, Great Lakes Brewing in Cleveland and Henry's 12th Street Tavern in Portland, Ore., bring a level of interest to the experience. The place does not have to be old, it just has to respect the heritage of beer. The older I get, the more I feel that clean air adds to atmosphere. Recent laws passed in many places to ban smoking in restaurants and bars have greatly added to an enjoyable atmosphere. This has not reached my current home state of North Carolina, so I still smell like an ashtray after visiting many bars. Cigarette smoke interferes with the senses and makes tasting good beer more difficult. If they can go without smoking at the pubs in Dublin, we can do it in Charlotte. It is not an individual rights issue, it's a health issue. I'm not against music, but unless it is a good live band I don't think you should get blasted out of the place by recorded tunes. A television for sporting events and bar games can help you kill some time and add to the experience. But for me, the true test of atmosphere is how conducive is the place to a conversation between friends? A great tavern is a social gathering spot to meet old buddies or to make new friends. You cannot do that while yelling. I published a post back in February as a Weekend Watering Hole entry titled "100 Places to Have a Beer Before You Die." You can check out the list and get an idea of what I hold near and dear when it comes to atmosphere. Defining great atmosphere is a very personal thing. You know it when you see it...or hear it...or taste it...or even smell it. It is also situational. Sleek and modern is great some times, while historic is perfect for other occasions. An outdoor deck is the ticket one time, a cozy indoor setting with a roaring fire another time. The mix of people and the staff on hand at any given moment can change the atmosphere. Even the type of day you happen to be having plays a critical role. In the end, the atmosphere can change like the weather. Factors similar to the temperature, barometric pressure, humidity, wind speed and direction, cloud cover and the chance for precipitation are all constantly changing and alter the atmosphere. In the end, the only controllable part of the equation is the attitude we each bring. So whether it's a night on the town or a Saturday afternoon on your deck, bring the kind of mood you want to find when you walk through the door. Set the atmosphere. Olde Towne Brewing Co., the first brewery to operate in Huntsville, Ala., since Prohibition was instituted in the state in 1915, was destroyed by a fire early today. The microbrewery opened in 2004. It was housed in a former Belk's Department Store in Huntsville. Don Alan Hankins, is the owner and head brewer at Olde Towne. In two weeks this blog will turn a year old. It has been fun and interesting to chronicle the world of drinks and this entry marks my 500th since starting the blog. "The great thing about writing about beer, wine and spirits is that interesting stories can be found no matter where you travel. You can visit Trappist monasteries in Belgium where the monks brew beer. You can tour a number of wineries in California that are owned by actors and directors. You can enjoy a $1,000 mint julep at Churchill Downs during the running of the Kentucky Derby. Or you can just pour your favorite beverage in a glass and spend part of a Saturday evening on your deck with family and friends. That's what this blog is going to be about. My goal is to further the discussion of great libations, talk about some of the issues facing beverage companies and drinkers, plus share a few fun stories. Thanks for coming along for the ride." It has been interesting to watch the site visits to Lyke2Drink increase. Traffic to the site comes in a number of ways. Nearly a third (31%) comes in straight through the http://Lyke2Drink.blogspot.com URL. They are either regulars, people who have found me listed on another bloggers blog roll (I urge you to visit the bloggers listed in my blog roll. There is some great writing to be found and interesting information regarding the drinks world. ), or through a search engine listing not linked to a particular post. 1. Sitting on a Bar Stool: The Greatest Drinking Songs of All-Time -- 5 percent of all hits. When you combine the total hits from these posts with the home page generic URL visits for Lyke2Drink you end up with 49 percent of all of the traffic to hit the site. There is obviously a common thread among the top entries when you look at the number that involve celebrities. The spread of types of beverages in the top 10 is pretty evenly split: 3 spirits, 2 wine, 2 beer, 1 malternatives and 1 music related. That split changes a bit as you move down the list. In posts 11-20, the mix is 5 beer, 3 spirits and 2 posts related to drinking and the law. Thanks for visiting Lyke2Drink during the last 50 weeks -- we're almost 1! Lucy Saunders has been writing about beer and cooking since the late 1980s and I've been lucky enough to know her most of that time. Her website, www.beercook.com, is a great place to visit to learn more about beer and cooking. Her recent book, Grilling with Beer: Bastes, BBQ Sauces, Mops, Marinades & More, Made with Craft Beer has come in handy around the Lyke2Drink household this summer. Published by F&B Communications ($21.95), it is 218 pages of great recipes using beer that make grilled foods jump off your plate. How does Lemon Weiss Marinade sound? Or Smoky Porter Maple Glaze? Perhaps Raspberry Ale Grilled Duck is more your speed. Lucy's stated goal in the book is to "introduce the flavors of craft beer into outdoor cooking" and she accomplished that with more than 100 recipes that feature beer as a key ingredient. Along the way she takes us to places like Colorado, New Zealand, Australia and New England to see how people in those locations use beer and barbecue grills in creative ways. One of my favorite sections describes classic beer styles and how the flavor components work in various cooking techniques. For those of us who believe that beer is at least as good as wine as a cooking ingredient and an accompaniment to food, Lucy Saunders has made our point in Grilling with Beer. There are more than 1,000 pints of beer purchased by well wishers around the globe waiting for John Smeaton at the Glasgow Airport Holiday Inn. He earned each and every one of them. John Smeaton, 31, is a baggage handler at Glasgow Airport in Scotland. When Al-Qaeda linked terrorists drove a flaming Jeep into the Glasgow terminal on June 29, Smeaton was nearby on a cigarette break. Not for long. Smeaton took action when most others might have turned and run. Smeaton is credited with rushing to help a police officer who was being attacked by one of the terrorists. After news of his act of heroism was featured in Britain and around the world the magic of the web took over. YouTube suddenly had videos of Smeaton uttering his now famous response to global terror: "This is Glasgow. We'll set about ya." Smeaton was proclaimed the Scottish answer to Jack Bauer, the lead character on 24, and the real John McClain of Die Hard fame. He was even called a Braveheart for a modern Scotland. The people behind a racing website called JustGoFaster set up JohnSmeaton.com. It is a humorous effort to build the Smeaton legend and to thank the Glasgow man by buying him 1,000 pints. Using PayPal to contribute $6.05 each, web surfers have responded by buying more than 1,000 pints in just a couple of days. There is no word on whether Smeaton plans to collect, but I doubt he will have to reach for his wallet if he wanders in to any pub in Scotland. Tuesday Tasting is a regular feature of Lyke2Drink that explores some of the best beers, wines and spirits on the market. This week we head to the Caribbean for some rum. Tommy Bahama Rum is a rum made on the island of Barbados at the R. L. Seale Distillery, which has been crafting rum for more than 80 years. Imported by Sidney Frank Importing, the rum comes in two styles: White Sand and Golden Sun. The rum is made from blackstrap molasses and uses a yeast imported from the wine-growing regions of South Africa. White Sand is aged for at least two years in oak barrels. It has a sweet nose and hints of coconut and mango in a fairly long flavor profile. This rum is perfect for cocktails. Golden Sun matures a minimum of three years in oak barrels. There are nice roasted almond notes with hints of toffee in the finish. You can mix this rum or drink it over some ice. The Tommy Bahama brand is best known for its sportswear line, but the brand can also be found on watches, furniture and even tropical-themed cafes. The extension into rum appears to fit the brand and the product is nicely made. In a category with a dominant player, the marketing power of Tommy Bahama may help generate some deserved trial for the product. Lyke2Drink is in danger of turning into People magazine or E! Entertainment Television, thanks to all of the celebrities who have recently decided to get into the drinks business. The latest addition to the group is country music star Kix Brooks of Brooks & Dunn fame. This past weekend Arrington Vineyards opened in Tennessee. Brooks is a partner with Fred Mindermann and Kip Summers in the vineyard. Arrington is Williamson County’s first commercial winery. Eleven different wines available for tasting and purchase at the winery. So far, the winery is the only place you can purchase the Arrington label. Dan Whitney, who most people know by his stage name -- Larry the Cable Guy -- is about to get a beer produced in his honor. SchillingBridge Winery & MicroBrewery of Pawnee City, Neb., is moving forward with the Git-R-Done brand, which is the comedian's popular catch phrase. Whitney grew up in Pawnee City, which is 100 miles south of Omaha, where the beer will be brewed until SchillingBridge expands. 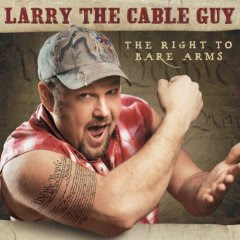 The Larry the Cable Guy character became popular through the Blue Collar Comedy Tour and Whitney has appeared in a number of movies.